An Australian man was left with burns when his Samsung Smartphone “exploded” as he slept in his hotel room in Western Australia. Tham Hua, a Victorian said on Wednesday in Melbourne that his Samsung Galaxy Note 7 exploded in his hotel room, bursting into flames. “My brand new Note 7 exploded this morning while I was still asleep, it was plugged in and charging. “Phone completely fried as Samsung told me this is the first case in Australia,’’ he said. 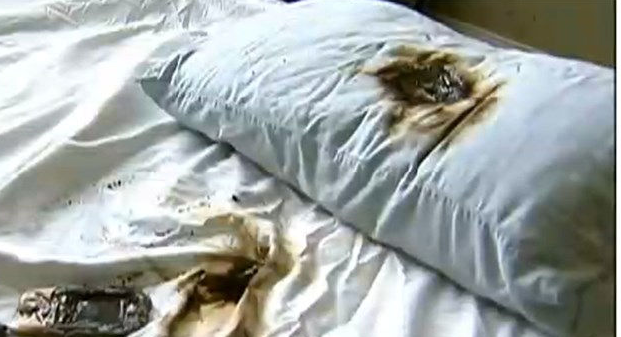 Hua said that it charred the hotel room bed sheet and the carpet when he whacked it down to the floor. He added that it also burnt one of his fingers while doing that too. Hua said the accident caused 1,300 dollars worth of damage to his hotel room which Samsung offered to cover. “Samsung staff had “no idea” what to do with my phone when i took it to a Samsung store “wrapped in newspaper and inside a zip-lock bag.” “It’s the first time they saw such a thing. “They gave me a loan device, and I have been promised that they will take care of the hotel damages bill,’’ he said. Samsung issued a global recall for its flagship Smartphone Galaxy Note 7 units in early September after the technology giant discovered a battery fault in the phone which caused it to explode. More than 35 cases of the exploding battery defect have been reported since the phone, which retails for 1,035 dollars, was launched on August 19. Samsung has now owners of the Galaxy Note 7 to turn off their phones and leave them off until they can be exchanged. Samsung Electronics Australia advised all customers who use a Galaxy Note 7 Smartphone to power down their device return it to its place of purchase. It also advised that such customers should use an alternative device until a remedy can be provided.